Shortcrust pastry layers are smothered with almond jam-walnut filling and covered with rich dark chocolate. 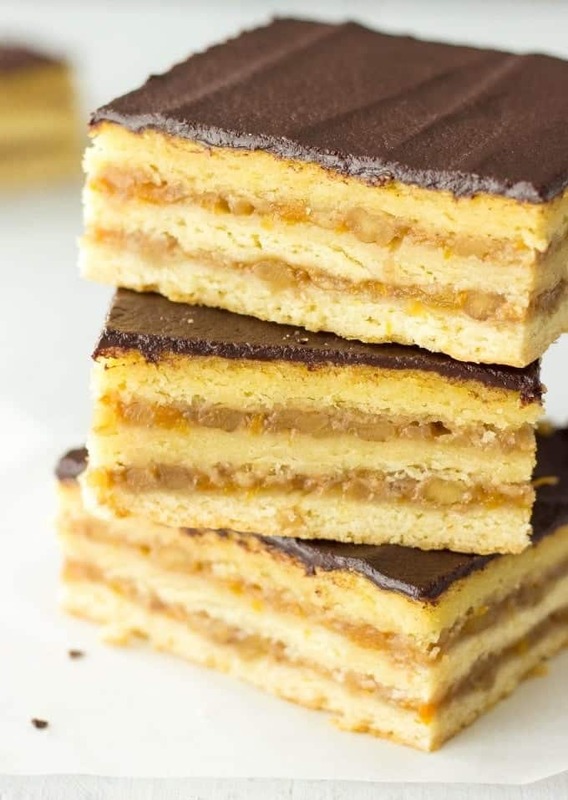 This Hungarian Gerbeaud Cake is moist and so delicious! 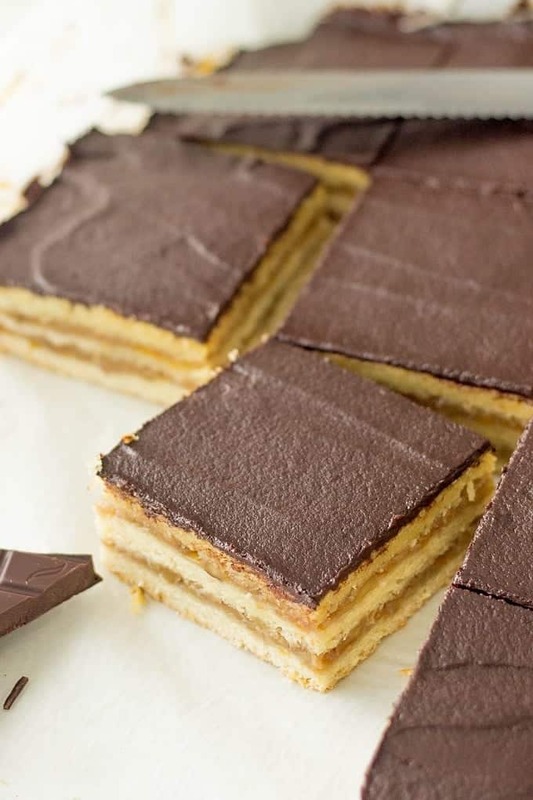 It makes a big batch and just like my Chocolate Eclairs, Gerbeaud Cake is perfect for potlucks, picnics or other special occasions. I’m pretty sure that the first time I visited Hungary I haven’t tried Gerbeaud Cake. Honestly speaking, I don’t even remember the food that I had back then. Hungary was one of the first European countries that I was lucky to travel to and I was so impressed by its beauty that I didn’t pay much attention to the local cuisine. Now, that my blog is all about European recipes, I’m slowly starting to explore more and more recipes of my favorite places that I’ve been to. Gerbeaud Cake is named after a Swiss confectioner Emil Gerbeaud in 18th century. He used to live in Budapest and took charge of a famous Confectionery Kugler, which he later renamed to Café Gerbeaud. He was the one to invent several famous Hungarian desserts and delicious Gerbeaud Cake was one of it. 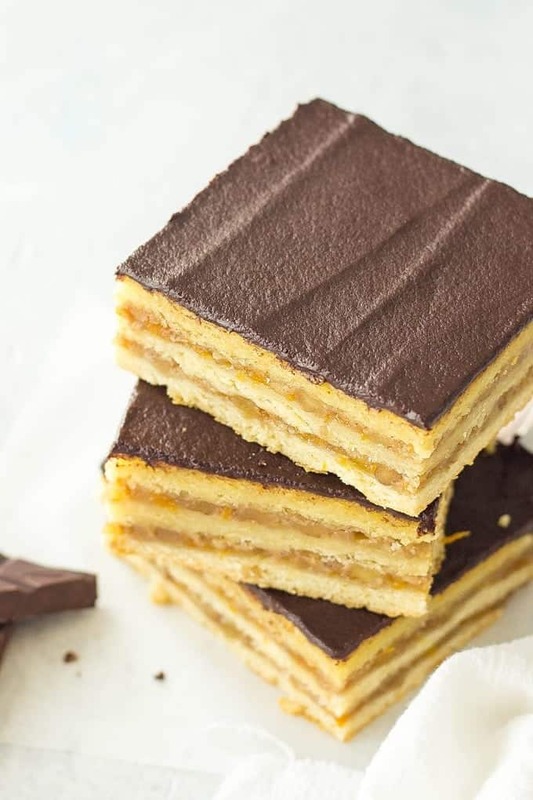 Just like my Russian Sour Cream Layer Cake, this traditional Hungarian dessert consists of several layers of shortcrust pastry which are slathered with a thick layer of apricot jam and walnut mixture and followed by an impressive layer of melted chocolate. Dessert comes moist and crispy at the same time with an incredibly delicious filling! It’s definitely a crowd-pleasing dessert that is not difficult to make. Original Gerbeaud Cake recipe uses apricot preserves, however you can make your own twist to the recipe and use any other jam you like. Start off with making the dough. In a medium bowl combine flour, yeast and baking powder. In a large bowl whisk together egg, warm milk, sugar and melted butter. Gradually stir in flour and yeast mixture and knead until the dough is smooth and not sticky. Cover the bowl with a plastic wrap and place it in a warm place to rise for 30-40 minutes. I’ve actually started the process the night before. So I put my dough in the fridge and the next morning when I was ready to continue, I took it out the fridge and let it come to a room temperature. Meanwhile, in a medium bowl mix together walnuts and apricot preserves. 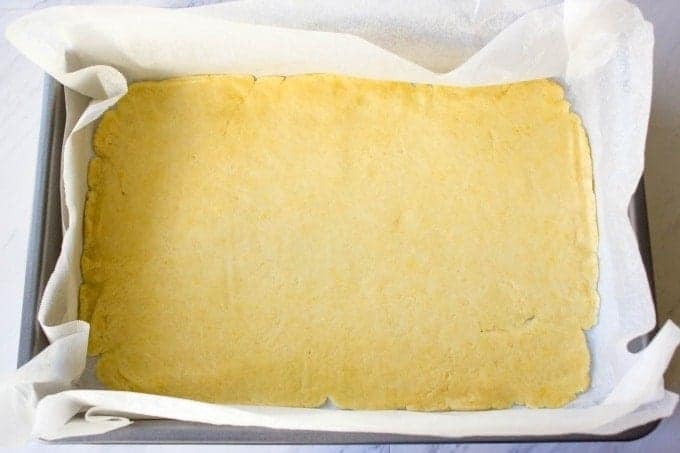 Line 13×9-inch baking pan with a parchment paper. Divide the dough into 3 equal parts. I found the best way to ensure this is by weighting the dough. Here are my favorite kitchen weights that I use all the time. 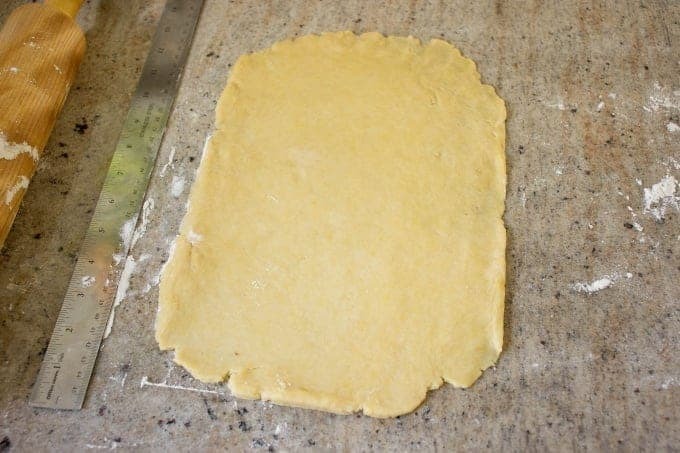 Next, lightly dust a working surface with a flour and roll out the first piece of dough to be the size of your baking pan. I used a ruler for convenience. Transfer first layer of dough into the baking pan. It’s okay if you have little gaps here and there, you won’t feel them in the final result. Generously spread half of almond preserve-walnut mixture on a first layer of dough. Repeat with the remaining 2 layers of dough. Pierce the top layer with a fork 10-15 times. Bake the cake for 25-30 minutes at 355 F until top is golden brown. Now, is the my favorite part – spreading of hot chocolate. I used good quality bittersweet chocolate, melted it in the microwave along with a some butter and generously spread it on top of the cake. You can lick the spatula after:) Yummy! And we’re pretty much done. 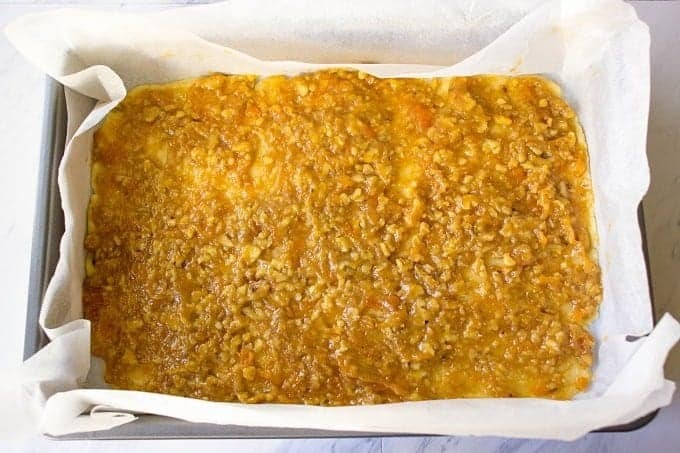 Not too difficult at all and the best part – the cake comes out incredibly delicious and rich. In a medium bowl combine flour, yeast and baking powder. 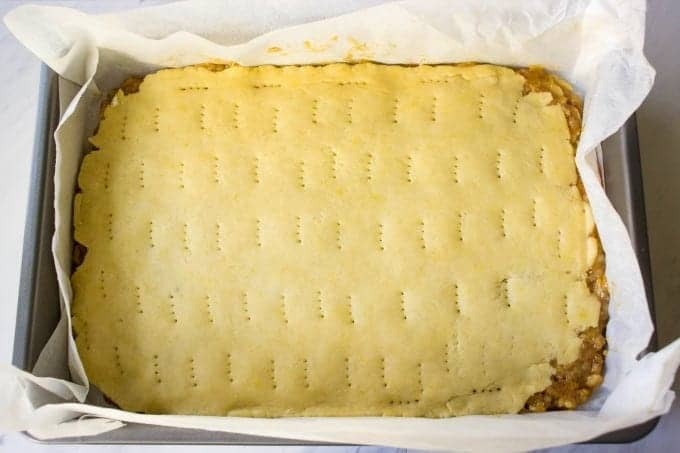 Line 13x9-inch baking pan with a parchment paper. Divide the dough into 3 equal parts. Lightly dust a working surface with a flour and roll out the first piece of dough to be the size of your baking pan. I used a ruler for convenience. Transfer first layer of dough into the baking pan and spread half of the apricot-walnut mixture on top. Repeat with the remaining 2 layers of dough. Pierce the top layer with a fork 10-15 times. Bake the cake for 25-30 minutes until top is golden brown. In a small bowl combine butter and chocolate and microwave in 10-15 seconds intervals until melted. 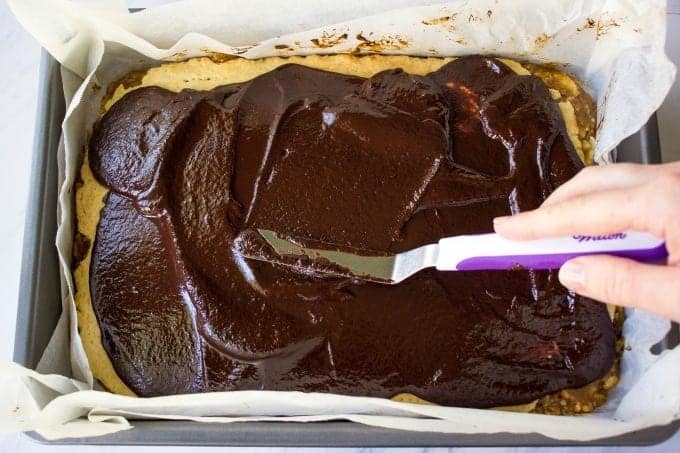 Give it a stir and evenly spread the chocolate on top of the cake. Chill for an hour or until chocolate is set. Try this traditional Gerbeaud Cake and let me know what you think. If you make my Gerbeaud Cake recipe, don’t forget to snap a picture and post it on Instagram with a hashtag #lavenderandmacarons. I’d love to see your creations. Probably make in the morning and serve that same evening? Will it stay in refrigerator till I serve? Wow this looks gorgeous! Your layers are perfect! Next time I am in Hungary I definitely want to give this a try. Thank you Natanja! I would love to try this dessert in its place of origin too! Hungary has some great food. I tasted gerbeaud cake a long time ago and it was such a wonderful and unique dessert. Never thought of making it myself but this recipe looks and sounds absolutely delicious and the cake looks gorgeous! TOTALLY pinned this DELICIOUSNESS!!! oh my goodness!! The flavors in this!! Amazing!! Well, you had me at the first pic when I saw this fabulous dessert!! I am for sure going to make this!! Thank you so much Camila! I’m glad you liked the pictures! Never heard of this before. I am glad for the opportunity to learn about Hungary through this awesome dessert. Looks yum. This looks sooo good! I love recipes that have a cultural background – thank you for sharing the history too! You’re welcome Jillian! I’m glad you like it! What a brilliant looking cake and an amazing recipe. 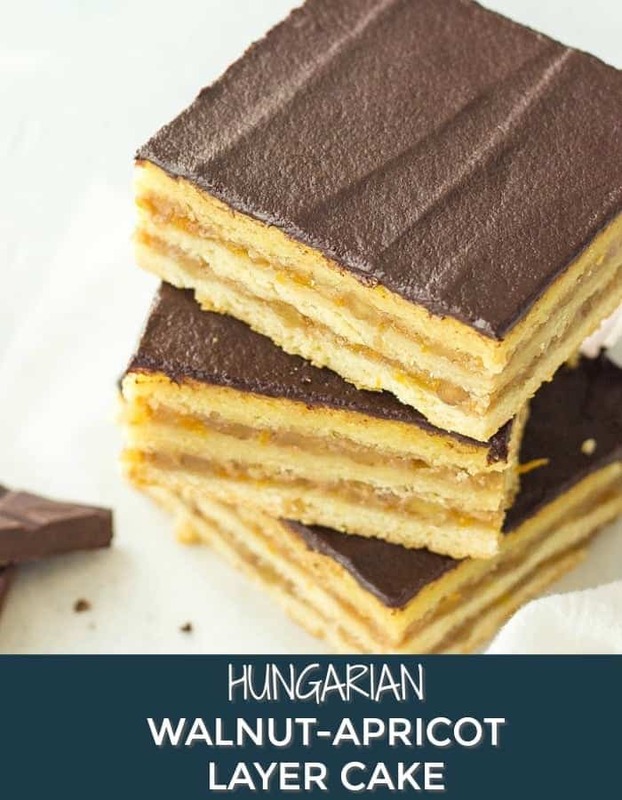 Thanks for introducing me to this Hungarian Cake.